The “Trip computer” displays information relating to the operating status of the car. 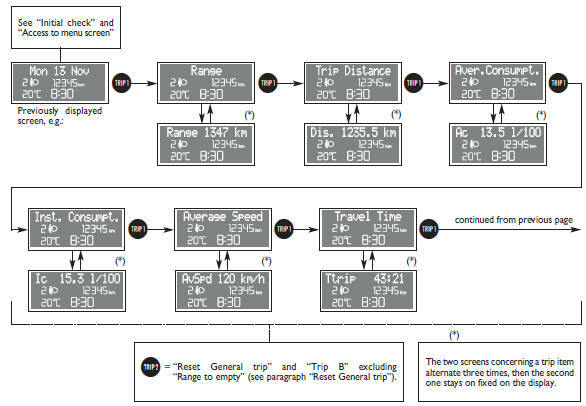 This function comprises the “General trip”, concerning the complete mission of the car and “Trip B”, concerning the partial car mission. This function (as shown in the graph below) is contained within the complete mission. Both functions are resettable. 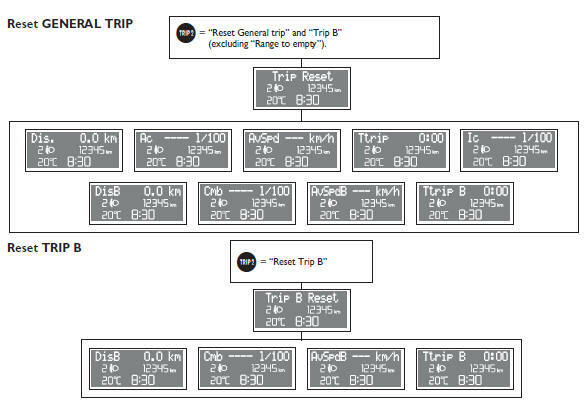 The “General trip” displays the figures relating to Range, Distance, Aver. Consumpt., Curr. consumpt., Avg. speed, Traveltime. “Trip B” displays information concerning Distance B, Aver. Consump. B, Avg. speed B, Traveltime B (driving time). The “Trip B” function can be excluded. Value selected will be displayed until new information is requested. The reset operation in the presence of the screens concerning the “General trip” makes it possible to reset also the “Trip B”. 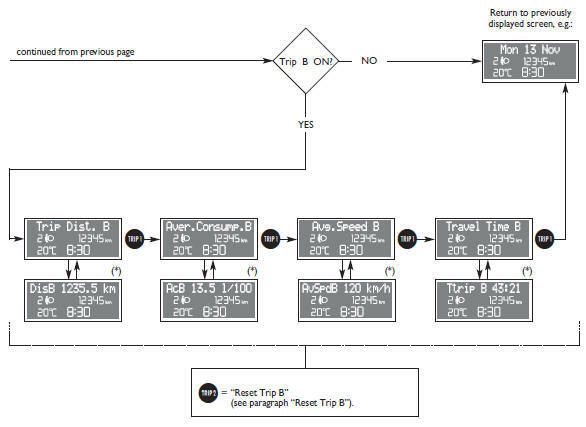 The reset operation in the presence of the screens concerning only the “Trip B” makes it possible to reset only the information associated with this function. IMPORTANT The “Range” information cannot be reset. Range to empty = shows the distance in km (or miles) that the car can still cover before needing fuel, assuming that driving conditions are kept unvaried. car parked with engine running for long time; when restarting range indication will be displayed again. Distance travelled = shows the km (or miles) covered from the start of the new mission (*). Average consumption = shows the average consumption calculated from the start of the new mission (*); this value can be expressed in km/l or l/100 km or in mpg. Instant consumption = shows fuel consumption variation, this value is updated constantly. If the car is parked with engine running the display will show “- - - -“. When restarting the car, the instant consumption indication will be displayed again. Average speed = shows the average speed of the car in relation with total time elapsed from the start of the new mission (*). Trip time = time elapsed from the start of the new mission (*). IMPORTANT Lacking information, Trip computer values are displayed with “- - - -”. When restoring normal operating conditions after a failure, calculation will restart regularly without resetting either previous displayed values or the start of a new mission (*). IMPORTANT After disconnecting/reconnecting the battery, certain displayed values will be equal to “- - - -” until significant data for recalculation are available.